#1 Jeff Cannonball (@JeffCannonball)-In one of the closest official votes in recent memory, Jeff Cannonball takes home his first #1 ranking after winning the Survival of the Sickest Tournament over the weekend. He edges out Danny Duggan for the number one spot by just a hair after a FANTASTIC weekend where he defeated Brad Cash and Tank in a triple threat at On Point Wrestling in the first round on 5/6, then defeated former #1 Matt Tremont in the semi-finals, and then JD Horror in the final to win the tournament with a 3-0 record for the week. It’s “Death Match Season” and with Josh Crane winning the Carnage Cup and getting a #2 ranking last week and Cannonball getting a #1 this week, it’s clear that the upcoming Death Match Tournaments are likely to play a huge role in the Indy Power Rankings. #2 Danny Duggan (@dannydugganpro)-What a week for this Canadian talent as he came JUST shy of his first-ever #1 ranking. That said, his week was absolutely insane at CWE as are most tours that the promotion does. He started the week as he teamed with Phil Atlas at Canadian Wrestling’s Elite on 5/1 to defeat Tasty Travis & Kute Kody, then defeated Kevin Cannon on 5/2, then teamed with Omar Amir on 5/3 to defeat CWE Tag Team Champions The Cannon Clan (Jacob Creed & Bobby Collins) by D, then teamed with Omar Amir & Paul Orndorff the same day to defeat The Cannon Clan (Jacob Creed, Bobby Collins & Kevin Cannon) then defeated Kaz Karter on 5/4, then defeated AJ Sanchez on 5/5, and then defeated former #1 Chase Owens on 5/6 to go 7-0 for the week. 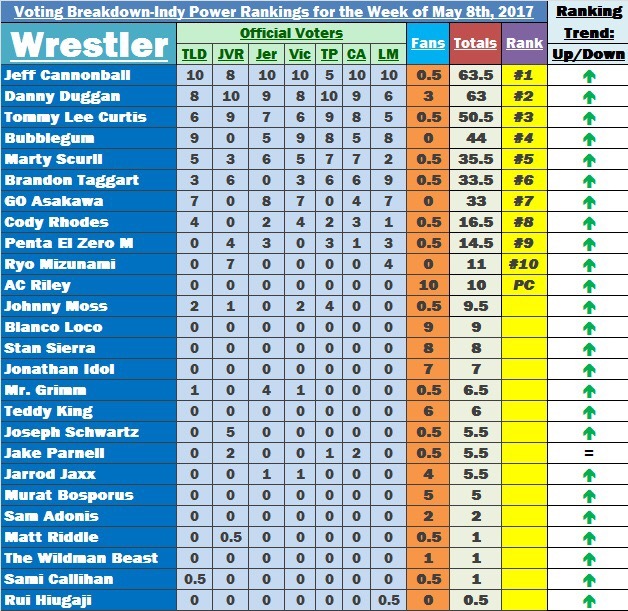 #3 Tommy Lee Curtis-CWE is responsible for #’s 2 and 3 in the Indy Power Rankings this week as Tommy Lee Curtis shined on CWE’s recent tour. Canadian Wrestling’s Elite 123Approved.ca TV Champion defeated AJ Sanchez on 5/1 to retain the title, then defeated Kute Kody on 5/2 to retain again, then defeated k-dos on 5/3 to retain again, and then defeated Nate Hardy on 5/5 to retain again to go 4-0 for the week. This is the highest ranking ever for T.L.C. as he used his 4-0 week to make a mark for himself in the Top 10. Like Duggan, if CWE continues with these tours with MULTIPLE big matches, he’ll have a chance to get ranked again in the future. #4 Bubblegum (@pipbubblegum)-The former multiple time #1 in the Indy Power Rankings returns to the Top 10 this week after a dominant week in Europe. The 4FW Junior Heavyweight, Just Do Wrestling, Absolute Wrestling and NEW Southside Wrestling Entertainment Speed King Champion defeated Damian Dunne in the first round of the title tournament at SWE on 5/6, then defeated Robbie X, Suicide, Zachery Wentz, Chris Tyler & Dezmond Xavier in a six-way elimination final the same day to win the vacant title. He then teamed with Angelico & El Ligero the same day to defeat Guilty by Habit (Damian Dunne, Kip Sabian, Robbie X) to go 3-0 for the week. He truly is one of the best unsigned wrestlers competing in the UK right now and his rankings have proven it. 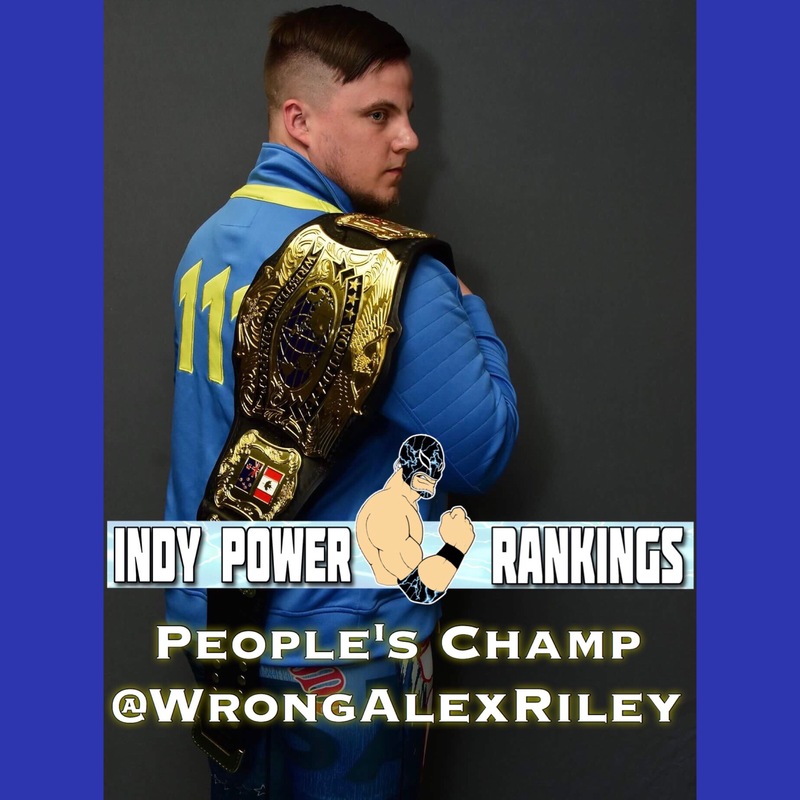 #5 Marty Scurll (@MartyScurll)-“The Villain” and last year’s #2 in the IPR 100 returns to the Indy Power Rankings this week as he scored 2 huge victories over the weekend. First, the ROH World Television Champion beat Donovan Dijak at Over the Top Wrestling in Ireland on 5/6 and then beat Kyle O’Reilly at Revolution Pro Wrestling in the UK on 5/7 to go 2-0 for the week. We haven’t seen much of Scurll in the Indy Power Rankings lately due to his ROH commitments, but there’s no doubt that if he can continue the momentum he has in independent wrestling promotions around the globe, you’ll be seeing more of him in the Top 10 as 2017 rolls on.